1. Cut each tomato into 6 wedges. Put in a bowl and season with salt. Add 1 tbsp oil and the olives, then toss together with the rocket. 2. 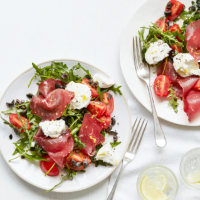 Divide the salad between 4 plates, then top with the bresaola slices and dollops of ricotta. Grate a little lemon zest over each plate, add some black pepper and squeeze a little lemon juice over the bresaola. Drizzle with the remaining olive oil and serve with crusty bread, if liked.